Rebekah Thoroughgood was having a rough time after two severe head injuries. One from her sporting activities and one from her farm horse. Her first injury from the horse’s hoof was bad. It also damaged a lot of her teeth. She suffered many common symptoms from her concussion; memory loss, headaches, blurred vision and loss of concentration. But after her second concussion, which wasn’t as severe as the first, it sent Rebekah over a tipping point that sent her down a long road and painful road. For quite some time she really didn’t believe anything was going to get better. She had been treated by both her GP and a neurologist. They prescribed a number of drugs as part of her treatment but none resolved her symptoms. Most made aspects of her symptoms worse. Nausea and concentration loss was a major issue. After suffering for more than a year, Rebekah and her family were thoroughly fed up with her current course of treatment. Rebekah’s mood was suffering and concern for her future health was weighing on the family. No one seemed to be able to offer anymore than her current course of action, which had resulted in no change. Then, late in 2015, Rebekah’s mother read an article in the NZ Herald on mild Hyperbaric Therapy (mHBOT) and Pulsed Electro-magnet field treatment (PEMF). The mHBOT was specifically of interest as it had been used for concussion treatment in New Zealand. PEMF’s had related benefits for the bodies uptake and distribution of oxygen. In short, both therapies were complimentary. After some deliberation, they made the difficult decision to make the trip from Warkworth, Auckland, to the Kapiti Coast in Wellington. It was a long way from home but they felt it was worth investigating. After arriving at Health Evolution’s Clinic, our team conducted a short assessment of Rebekah’s current state of health. We concluded she was an excellent candidate for dual treatment using short bursts of PEMF sessions prior to 90min sessions in our mild pressure hyperbaric chamber. We were hopeful she would respond fairly quickly and definitely see some alleviation of her chronic symptoms. 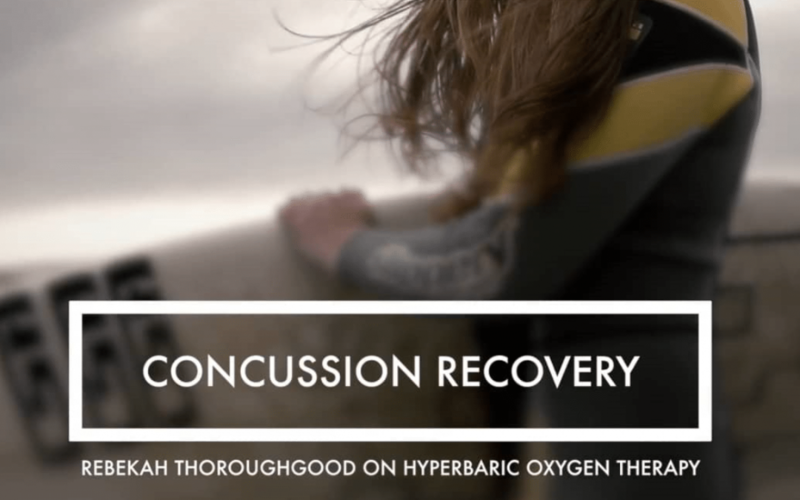 Rebekah and her mother had their doubts the treatment would have much affect given their lack of success with standard treatments for concussion. However, after just ten treatments Rebekah felt a change in her wellbeing. She felt definitely different. Her symptoms weren’t quite as bad as they had been. Buoyed by this early success, they opted to continue the treatments for another ten to fifteen sessions. Initially there wasn’t much change for the next ten sessions but after the twenty second treatment there was a dramatic lift in both her mood and her symptoms. Her state of improvement was even visibly apparent to all the staff our at clinic as well as Rebekah’s mother. Her symptoms had nearly all gone and her state of mild depression seem to have lifted. She continued treatment up to a total of twenty nine session by which point she was completely symptom free. Upon returning to Auckland Rebekah had a follow-up visit with her neurologist. He reviewed her case and her symptoms and concluded she was now cured of her concussion symptoms. He does not however believe her therapy in Wellington had any bearing on her recovery. Here at Health Evolution we believe both these therapies assist the body recover and do what it does best. Heal. We’ve seen many cases like Rebekah’s where conventional treatment has failed to deliver any substantial or lasting result. We would dearly love to conduct clinical trials here in New Zealand for both mHBOT and PEMF treatments to validate their viability as perfectly reasonable options for treatment in cases like Rebekah’s.